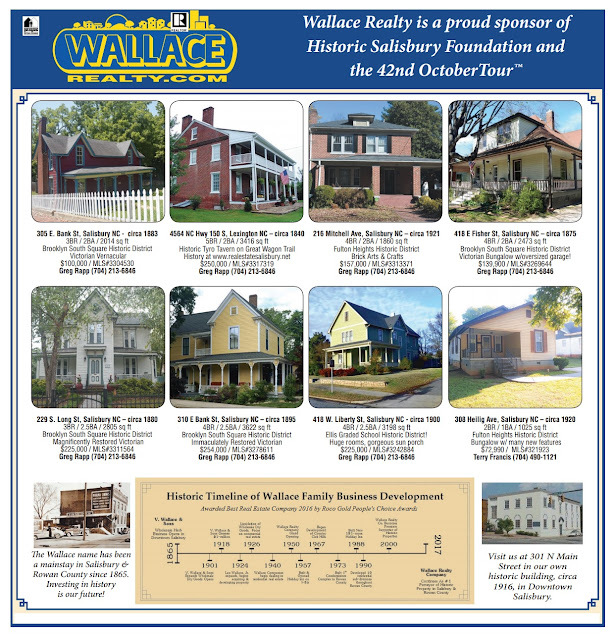 Greg Rapp with Wallace Realty has earned himself a reputation as Salisbury-Rowan County's top-notch marketer of historic properties. . . and there is a reason! This is OctoberTour™ weekend in Salisbury, North Carolina. This is the 42nd year that this immensely popular tour of historic properties has come to town, courtesy of the Historic Salisbury Foundation. Each year, private property owners open up their vintage homes to thousands of visitors. Greg Rapp has consistently been the front-runner in selling historic properties here. One look at the Wallace Realty advertisement in this OctoberTour weekend edition of the Salisbury Post is proves the case in point. 90% of the historic listings are with Greg Rapp. Greg has been awarded Preservation Professional of the Year by the Historic Salisbury Foundation, and has been voted 2nd runner up in the Salisbury Posts' Roco Gold People's Choice awards. This comes from a dedication to marketing historic properties here in methods that WORK! Visit OctoberTour . . . and you'll surely be inspired to own a vintage home of your own, and when you are, let Greg show you the fabulous antique homes in the area. From big to small, rugged to restored, there is something for everyone. Ready to downsize from your spacious vintage home? Greg is the one to call: 704.213.6846. Let's make this happen! Another Home Sold . . . in Four Hours!